Colin Tizzard’s high-class Cue Card proved the ace in the pack in an outstanding renewal of the Grade 1 Betfair Chase at Haydock on November 23 and has now emerged as a genuine contender for top honours in the Cheltenham Gold Cup at the home of National Hunt racing on March 14, writes Elliot Slater. By general consent this was the best ever renewal of the Betfair Chase, a contest that long ago established itself as a serious trial for the Cheltenham Gold Cup and has been won by some of the top British steepelchasers of recent times. With last year’s winner Silviniaco Conti in the race alongside reigning champion Bobs Worth, former champion Long Run, last season’s star novice Dynaste, and others, Cue Card (9/1) was far from the punters’ main fancy in a race that simply oozed class. Trainer Colin Tizzard instructed his son Joe to take the bull by the horns aboard Cue Card, a horse who had never previously raced over the distance of three-miles-one-furlong. Clearly believing last year’s Ryanair Chase winner would stay, the pair set off at a good gallop and one by one the big names started to crumble, Bobs Worth, the favourite being one of the first beaten. Approaching the final fence Cue Card was under strong pressure as he was all but joined by both Silviniaco Conti and Dynaste, but showing tremendous determination and bags of class, he stayed on powerfully on the Haydock run-in to score a superb victory, leaving behind the disappointment of finishing only third at Exeter on his seasonal bow. 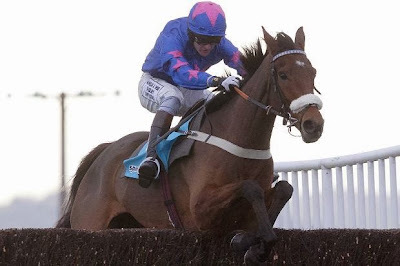 Slashed from a pre-race 27 to just 8.8 on betfair.com for the Cheltenham Gold Cup in the spring, Cue Card may next bid for the King George VI Chase at Kempton Park on Boxing Day where he could lock horns again with a number of his defeated rivals from the Haydock contest.